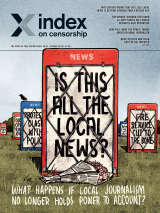 Index on Censorship is the magazine of free expression founded in 1972 by Stephen Spender. Originally a response to a plea from Soviet dissidents facing show trials, its aim was, and still is, to protect the basic human right to free expression. Since then, Index has reported on censorship issues from all over the world and has added to the debates on those issues. Each edition contains a country by country list of free speech violations and the list remains today as extensive as it was in the early days of Index. It is a harrowing reminder that continued vigilance is essential. The list of writers who have contributed to Index is an impressive testimony to its continued importance. They include Vaclav Havel, Nadine Gordimer, Salman Rushdie, Doris Lessing, Umberto Eco, Jack Mapanje, Noam Chomsky and Aung San Suu Kyi. Index is also a forum for new writers of whom the world will hear more. When the publication started there were between 7-10 staff when the magazine first started in 1972. At present, there are 11 members of staff, and we normally have about the same amount working on a volunteer basis. The aims of the organisation have not changed in the last 25 years, although the magazine underwent a dramatic editorial redesign with the appointment of Ursula Owen in 1993 as editor and chief executive. The focus of the magazine broadened to include contemporary debates on issues such as immigration, religious fundamentalism, the death penalty, and the condition of the world’s children. More emphasis has been placed on increasing worldwide circulation and influence since the relaunch of the magazine. In 2005, Index on Censorship joined the Taylor and Francis Group.